An attempt by Bloomberg TV to engage with the elusive world of digital currency backfired comically when a viewer managed to rob the anchors through their television set. Bloomberg had been running a special series of reports on Bitcoin in the leadup to Christmas entitled the ’12 Days of Bitcoin’. The idea behind the segment was to provide viewers with a better understanding of the elusive currency and some of the facts behind it. Amongst various angles on the story, Bloomberg anchor Matt Miller suddenly produced a Bitcoin certificate and proudly showed it to his fellow anchors, Adam Johnson and Trish Regan as the cameras zoomed in for a closer look at the paper representation. 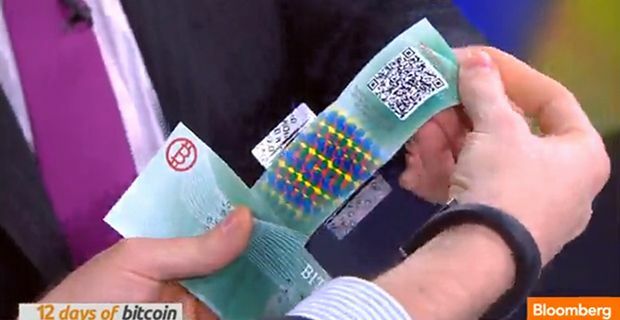 As the camera lingered on the close up, one viewer who clearly had a far better handle on the dynamics of Bitcoin managed to scan the QR code on the certificate and steal the $20 value. “The guy that is hosting the series gave bitcoin gift certificates to the other two hosts. One of them opens up the certificate to reveal QR code of the private key,” he wrote. "They then proceeded to show a closeup of the QR code in glorious HD for about 10 seconds. Hilarious." “I took it, it was only $20 worth. It was exhilarating nevertheless. I'll send it back once Matt gives me a new address since someone else can sweep the old one. A segment on bitcoin security and the importance of NOT showing the private key and also BIP0038 (Password Encrypted Private Keys) Wallets will be more than enough compensation. Miller proved he had a sense of humour about it all though, and when milywaymasta offered to return the cash, Miller followed up with the user on Reddit, stating that it would not be necessary.